As a boy sitting around the dinner table with his family, Peter Daut’s focus was usually on the TV in the background. But he wasn’t watching cartoons or superheroes, he was watching the news. Peter always knew he wanted to be a reporter, and he has come a long way since those family dinners. Peter, a 2002 Most Valuable Student scholarship recipient sponsored by Fullerton, Calif., Lodge No. 1993, is currently a TV reporter and fill-in anchor on the Fox station in Dallas-Fort Worth, Texas. Having only worked there for two years, he has already experienced more than he could imagine–he’s even won an Emmy! His life as a reporter changed on November 5, 2009, when he first learned of the shootings on the military base in Fort Hood. Peter immediately drove three hours to be on the scene to report the horrible story. He says it was one of the most disturbing events he has ever had to cover. And Peter did tell the story with care. He sought out the father of a wounded soldier who agreed to talk with Peter. Check out the footage of Peter's news coverage a few days after the shootings. While this event was one of the most profound in Peter’s young career, he has had other experiences that have shaped him into the reporter he is today. While attending college at the University of Southern California, Peter worked as a news writer for KABC-TV in Los Angeles. 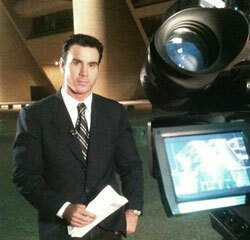 While working in El Paso, the Fox station in Dallas-Fort Worth took notice of Peter’s skills and asked him to join their team in December 2008. He now covers a variety of stories and loves what he does. Through all his work, Peter always remembers his family seated around the dinner table, the ones who helped him achieve his goals. He even dedicated his Emmy Award to them. In 2010-11, the Elks National Foundation allocated $2.296 million to fund the Most Valuable Student Scholarships. For more information about the Most Valuable Student scholarship program, including eligibility and deadlines, please visit www.elks.org/enf/scholars.